See the mechanics in detail and meet some of the makers in their workshops. 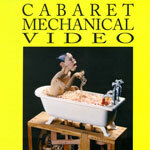 This DVD features over 30 different machines – a feast of the weird and the wonderful. Sorry! Out of stock. We are hoping to release a downloadable version in the future.